Inspired by the famous Noct NIKKOR, the AF-S NIKKOR 58mm f/1.4G from Nikon is a unique prime that pairs the distinct slightly long focal length with a fast maximum aperture. The bright f/1.4 design enables working in difficult lighting conditions and also permits working with shallow depth of field and selective focus techniques. In regard to the optics, a pair of aspherical elements are used to reduce distortion, spherical aberrations, and comatic aberrations to realize sharp, clear image quality throughout the aperture range. Both Nano Crystal and Super Integrated Coatings have also been applied to control flare and ghosting for improved contrast and color rendering. Additionally, a Silent Wave Motor provides fast, accurate, and quiet autofocus performance along with full-time manual focus override. Slightly longer-than-normal prime is designed for FX-format Nikon F-mount cameras, however is also compatible with DX models where it provides an 87mm equivalent focal length. Impressively fast f/1.4 maximum aperture excels in low-light conditions and also enables greater control over depth of field for isolating subjects and working with selective focus techniques. Two aspherical elements are used to greatly reduce spherical aberrations and distortion in order to achieve high sharpness, clarity, and accurate rendering. Additionally, the optical design has also been optimized for shooting at wider apertures, including f/1.4, and minimizes comatic aberrations and ensures even sharpness across the frame. 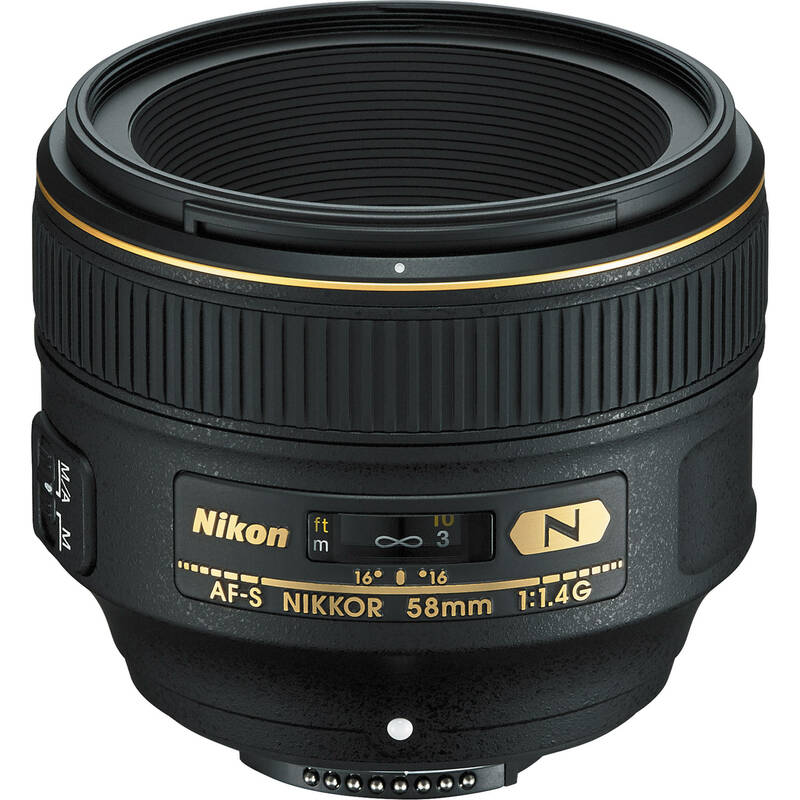 AF-S NIKKOR 58mm f/1.4G Lens is rated 4.3 out of 5 by 56. Rated 5 out of 5 by Noinker from Look no further for wedding photography I purchased this lens for wedding photography. I must say I had the urge to sell it a few times but I'm glad I didn't. The more I used this lens at weddings, the more I loved it. This lens takes time getting used to. You must have a professional body to have the best AF system, IMHO. The images that come out of this lens are AMAZING! The oval-like bokeh and 3D rendering is just phenomenal. However, if you're in a market for only ONE portrait lens, get the 85mm f/1.4G at this price. Or better yet, save money and get the best value for the money lens- the 85mm f/1.8G. The reason why I don't own an 85mm is because I also own a 70-200VRII which complements my 58mm f/1.4G better than the 85mm f/1.4G would. Overall- awesome lens!! Rated 5 out of 5 by docsid from Best 50 this side of the otus 50mm is a focal length that I use a lot along with the 85mm on FX. I have tried most mainstream 50s from nikon including the 1.8g. 1.4g and the sigma 50 1.4. This lens beats all of them in wide open sharpness and contrast. Color rendition is very pleasing. IF to OOF transition is the best among the mentioned lenses. My copy is very good in locking focus in low light situations. Folks who have inconsitent focus should send the lens back for replacement as this lens is better than both nikon 50s and sigma in acquiring and keeping focus. I only wish this was cheaper as 1700 is steep. At around 1000 this would have been a no brainer. Rated 5 out of 5 by Nikon Shooter from The 58/1.4g is Great But Not For All It is important you understand what this lens is all about or you may be disappointed. This lens was designed for gorgeous rendering and bokeh and it delivers. Designed for low light and nightscapes and it delivers. Designed for beautiful transition between sharp and blurry and it delivers. Not designed for razor sharpness wide open (but very sharp when stopped down) or that clinical look of modern digital lenses. 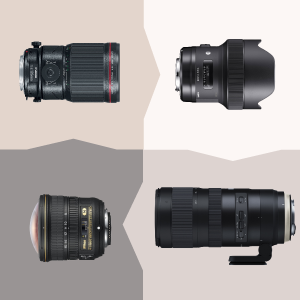 You can save money and buy the 50 1.8g or 1.4g or spend more money and buy the Otus ($$) or buy the 58 and get a great lens that delivers a unique look. Rated 4 out of 5 by jsl81 from Great lens but... This is a great lens. Its well built, produces great focus transition, renders colors well and creates images with character. The 58mm is a pleasing perspective. However when paired with my D810 it does not produce clinically sharp images on a pixel level. I give this lens 4 stars because it didn't suit my needs, and I expect a $ lens to be able to produce these type of images with more sharpness. I'm sure that when paired with a lower megapixel body it may perform better. In comparison, the Nikon 50mm f/1.4G performs better on sharpness, and it's about 1/3 of the price of the 58. If you shoot with anything other than D8xx bodies, and have deep pockets, definitely give this lens a try. It performs similarly to a Fujifilm X-T1 paired with the 35mm f/1.4. Rated 5 out of 5 by Drew from Hated Love I bought this lens really cheap on a good used sale and hated the thing on a d750. It just couldn't get sharp images by focus not sharpness. I upgraded to the d5 and it's now my most favorite lens. Especially love shooting it at 1.4 with a bright background. The specialty part of this lens blows any other lens like canons 50 or canons 85 1.2L out the water. Sure it's not the most durable but the auto focus on this lens with its specialty look beats any canon 85 1.2L focus as I've shot with other photographers at weddings and they never use past the portrait session where it's not fast-paced. I don't know what I would've done without this lens in my gear line up. Rated 2 out of 5 by David from worst nikon lens I've owned I'm a full-time commercial fashion photographer and wanted a focal length shorter than 85mm and longer than 50mm .. i thought this was it .. I shoot fashion mostly at f2.8-4.0 and I'm constantly walking around my subjects and moving with them. No matter how much I AF fine tuned this lens, the focus would shift forward or back from the eyes whenever I walked towards the subject. Compare my Nikon 70-200 2.8, Nikon 85 1.4 and Nikon 50 1.8 ALL nail focus, all day, every day under the same conditions... the 58 could not. Not a lens for a working professional. Tried to love it a number of times, and fit it into my work. Too many unusable shots. Sold it. Rated 5 out of 5 by Rene Hwang photography from Just as good as the other 1.4's If you are thinking about buying this len, I'm sure you've been reading a ton of reviews. I know I did. Many reviews I read mentioned that this lens is not as sharp as the 85mm 1.4. With this knowledge I struggled to make the purchase. But I'm glad I did buy it. It's just as good as the other Nikon 1.4's. Before this Lens, I had 2 other lenses, Nikon 35mm 1.4 and 85mm 1.4. My subjects are mostly people and getting the eyes sharp is my top priority. Even more important is getting the eyes sharp while the lens is wide open because I am a bokeh freak. To me this lens is just as sharp as my other 2 1.4's wide open and the bokeh is just as fantastic. Go check out flicker and look for photos shot with the Nikon 58mm 1.4 and judge for yourself. By the way, the lens is noticeably lighter than the 35 and 85mm 1.4's. This is a huge plus for me. Rated 5 out of 5 by Gianelle from Professional Photographer Okay, I really did quite of bit of studying on this lens, read about what seemed to be a hundred reviews, you tube videos. Spoke to fellow photographers, and finally after about 3 weeks took the plunge. 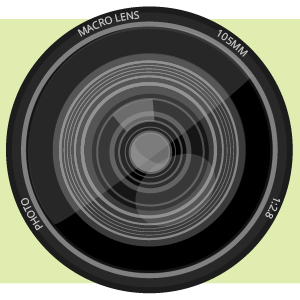 I bought this lens for special photography, specially people portraits, for indoor and outdoor. Bokeh on my copy is completely equal to my Nikons 24, 35, 85, and now 58 1.4s, creamy buttery backgrounds, with that 3D look. First thing I did out of the box was fine tune it with my Nikon D4S, as I do with all my primes, mine needed a +18 fine tune, which is not unusual, my other primes are between +10 and +18. It is very sharp now, not the snappiest focus, but that's okay, the photographs this lens puts out between 1.4 and 2.8 are fabulous, doubt I will ever shoot it any narrower, to me, that's why I buy expensive primes, to shoot them wide open, or very close to it. I think this lens will be seeing it's share of time on my camera, and hopefully make me $$$$. If you're an experienced photographer, YES, I would recommend ! I read about fine tuning this lens by one reviewer, but how is that done? I don't own this lens, but all Nikon lenses can be fine tuned using the camera menu and focusing on a printed scale at an angle to the single focal point. I use a bar code label. You need to be careful to check it at both near and distance. Most lenses do not need much/any change but my 35 1.4 G needs a +3 on several different bodies. I read somewhere that this lens was made for a crop sensor; my question is....are there any reviews of this lens on a crop sensor? I have the Nikon D7000 and am trying to find a sharp lens with great bokeh for portraits, and similar to the 85mm on a full frame. Any suggestions and comments would be greatly appreciated. This lens is an FX type lens, which means it is originally designed to be used on both Full-frame and crop-sensor cameras. I do not have any links to cite for you showing examples of it used on the D7000, but it is a very sharp lens with great shallow depth of field for your portrait work. It is one I would definitely recommend for your D7000 if you want something in the 85mm range. This lens is based on an original design of an early Nikon 58mm lens, and they improved upon it for use on DSLRs of both formats.